PRE-SEASON ORDERING IS OPEN FOR 2019! Why Carry Ski The East? • Apparel and accessories that add to the local offerings and culture of stores. East Coast skiers have a camaraderie and pride that's unlike anywhere else. They show pride for their region and rep their roots by purchasing Ski The East products. 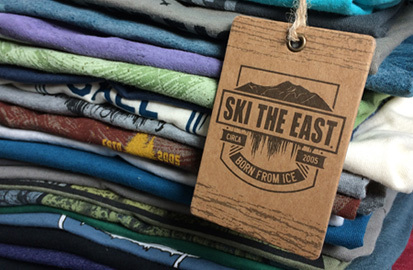 • Ski The East is brand that needs no explanation to the customer. It's both a slogan and a trademarked name that's a point of pride among ALL Eastern skiers, regardless of age or ability. Every single two planker that walks through your doors is someone who can relate to the brand. • Wholesale sales volume has grown on average 50% per year, 9 years in a row. • Minimum buys are low ($1,000) to make testing easy for new dealers. • No payment due until 30-90 days after receipt of shipment. • The brand offers fun, mid-to-low price point items that are extremely giftable, fill a niche, and move especially fast in November/ December.